Eugene Allen was a White House butler who served under 8 presidents over a span of 34 years until retiring under the Reagan administration. Although his life is the inspiration for “Lee Daniel’s The Butler”, that’s about where any similarities end. Forest Whitaker plays the long-time butler, whose name is changed to Cecil Gaines in the film, with a quiet reverence that is needed to compensate for the often emotional film. After growing up on a cotton farm, Cecil runs away and learns to work as a butler and server at country clubs, hotels, etc. Eventually he shows off his serving skills to the right person and gets a call to join the White House staff. Oprah Winfrey plays Cecil’s wife, Gloria, in arguably the film’s greatest performance, and David Oyelowo (“Jack Reacher”) turns in a solid performance as their son, Louis. Since this is an ensemble film, you will also see the familiar faces of Cuba Gooding Jr., Robin Williams, Vanessa Redgrave, Jane Fonda, John Cusack and a million other actors. Don’t get too attached to those names because you’ll probably only see them for about 90 seconds each. Although the three lead actors are all fairly commendable, every other character in the film is either paper thin or a boring caricature. Cusack’s Nixon is laughably bad but slimy as expected, James Marsden’s portrayal of JFK comes complete with a shining halo, etc. With such a large cast of players, it can be difficult at times to distinguish who the film is really about. Sure, it follows the events of Cecil Gaines’ life, but he doesn’t really do anything for 90% of the film. In ultimate “Forrest Gump” fashion, things just happen around Cecil (and sometimes his son, Louis) and his mere presence at important events is supposed to substitute for an actual narrative. Not that there is anything wrong with a civil rights film, but I wanted “Lee Daniels’ The Butler” to be more about the life of a White House butler over the course of 8 presidents. There are plenty of civil rights films out there (some that are better than this film), but very few films that give us a full narrative behind the White House gates. That being said, this film does offer a few ideas not present in most civil rights films, and this is where the film’s best moments are found. For one, I’m not sure I’ve ever seen a film that captured 1960’s sit-ins the way this one does. After going off to college, Louis gets involved with freedom riders and other civil rights activists where he is trained for civil disobedience. We see black and white students for equal rights pushing each other around, slinging the N-word and degrading one another to practice for their sit-in at a local diner. Both the training scene and the real deal at the diner are intimately humiliating and well-executed. The theme I really loved in the film was the clash of attitudes between African Americans born in the early-20th century and those born just after WWII. Cecil Gaines has been trained all his life to not speak on politics and to gently edge his way toward progress while Louis believes that direct, in-your-face action is the only way things will ever change. This struggle between the characters’ worldviews is easily the most interesting thing about the film. 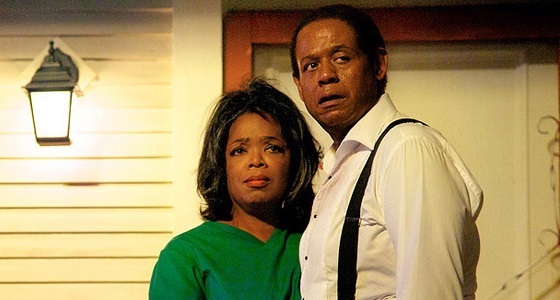 Despite its potential ability to be a crowd-pleaser, “Lee Daniels’ The Butler” is a long, melodramatic tale which features elementary writing and hit-or-miss acting. Though it has its moments, I think “12 Years a Slave” will be the slavery/civil rights film everyone is talking about come awards season. One of the greatest things about science fiction is that the audience gets to immerse itself in a new world with new rules, often to better understand problems that lie beneath the surface of our own world. In “Elysium”, writer-director Neill Blomkamp uses the story of an Earth overrun with ghettos and a utopia in the sky to present a dialogue on universal healthcare, overpopulation, immigration and the ever-widening wealth gap. It’s quite a bit to fit into an action film, probably too much. In the year 2154, the Earth has been all but destroyed from overpopulation. Former car thief Max (Matt Damon) is exposed to a lethal dose of radiation while working at a robotics factory and given five days to live. While that may seem like an insurmountable obstacle for us, the people of Elysium (a space station for the richest of the rich) have special healing pods that can cure all illnesses in a matter of seconds. This, of course, makes them nearly-immortal douchebags. Delacourt (Jodie Foster) is in charge of security on Elysium and, as she often proves, is happy to blow ships full of illegal immigrants seeking healthcare out of the sky to discourage future incidents. With a little help from local kingpin Spider (Wagner Moura) and his friends Julio (Diego Luna) and Frey (Alice Braga), Max looks for a way to get to Elysium so he can heal himself. A few years removed from the breakout success of “District 9”, Blomkamp once again takes us to the ghetto (this time Los Angeles) for a political/action mash-up. On the political side, what makes “Elysium” feel more cluttered than his previous film is that he tries to do too much preaching within what is really not that well-written of a film. As previously mentioned, there are several different political issues being hit here and none of them are handled as well as the apartheid issue in “District 9”. Since we’re on the subject of writing, this film really could’ve used another session to bring the script up from the shelf of mediocrity it currently rests on. None of the characters presented in the film are more than skin deep, but at least Damon and Sharlto Copley (as the villainous mercenary Kruger) try to make it up to the audience. Aside from the basic ideas it sets up and the world it creates, the writing in “Elysium” is bland and standard action fare. Although Damon and Copley may have given it their all in the film, the rest of the actors prove that bland writing makes for bland characters. The only actor who is truly awful in the film is Jodie Foster, though. Whether she was under misguided orders from the director or the character is her own reading, I can say with certainty it is the worst performance I have seen her give in a film. Needless to say, I was a little disappointed with “Elysium”. However, there were some really enjoyable things sprinkled throughout the film. The design of everything from the LA slums to the open-air space station Elysium is top notch. It’s too bad 80% of the film takes place in the slums because I wanted to see more of what made Elysium tick. The audience isn’t given the privilege of getting acquainted with a single member of the elite class unless you count Foster’s one-note villain who has roughly 15 minutes of screentime. The special effects and action choreography are also great assets of the film, but yet again I have to be Debbie Downer because those same action scenes are shot with one of the shakiest cameras of all time. 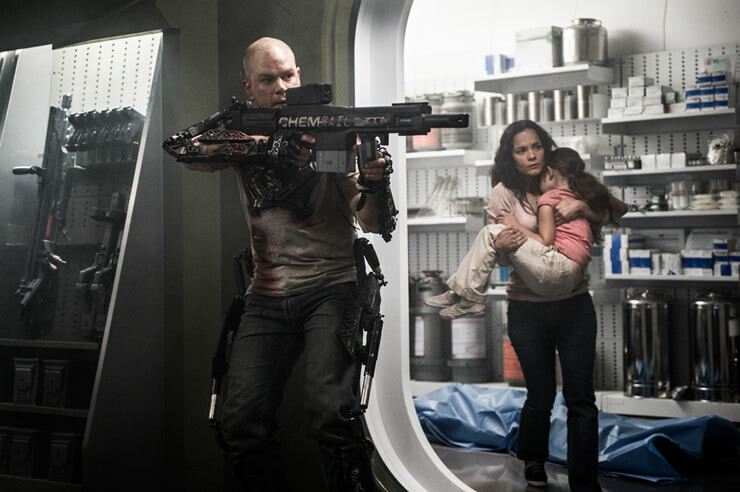 Despite the negativity of this review, “Elysium” is an entertaining film. Much like the majority of other science fiction films this year, it doesn’t live up to its potential. Though not living up to expectations, it still makes for a decent use of 2 hours.